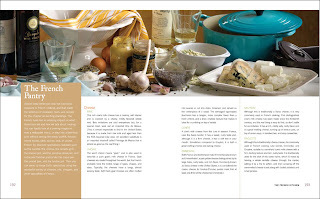 Almost every American cook has had some exposure to French cooking, and that made the selection of cookware, tools, and recipes for this chapter an exciting challenge. The French have had an amazing impact on what Americans eat and how we talk about cooking. You can hardly look at a cooking magazine, read a restaurant menu, or step into a fast-food joint without seeing the words soufflé, fondue, crème brûlée, pâté, quiche, and, of course, French fry. Discover specialized cookware such as the cocotte, the chinois, the raclette grill, the mussel pot, and the pommes Anna pan, and rediscover familiar pieces like the crepe pan, the omelet pan, and the fondue pot. Then you can serve up these Gallic specialties using the wonderful variety of cheeses, oils, vinegars, and other specialties of France. The word chèvre means “goat,” and is also used to describe a pure goat’s milk cheese in France. Goat cheeses are made throughout the world, but the French probably have the widest range of types, shapes, and sizes. Typically, the cheeses have a tangy, almost lemony taste. Soft fresh goat cheeses are often melted into sauces or cut into disks, browned, and served as the enterpiece of a salad. The semiaged log-shaped Bucheron has a tangier, more complex flavor than a fresh chèvre, and a drier, chalkier texture that makes it ideal for crumbling on top of salads. A cow’s milk cheese from the Jura in eastern France, near the Swiss border. It has a sweet, nutty taste and, although it is a firm cheese, it has a soft feel in your mouth. Sometimes compared to Gruyère, it is both a great melting cheese and eating cheese.